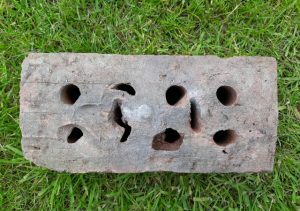 This was found by Ian Suddaby on the River Nith, Rosefield Mills, Dumfries. 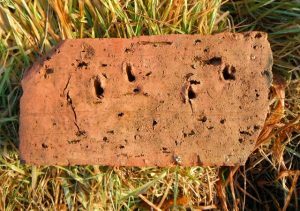 Several other similarly marked bricks were found alongside it. 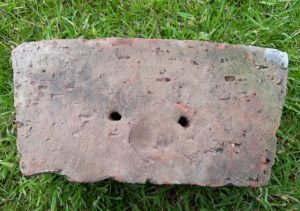 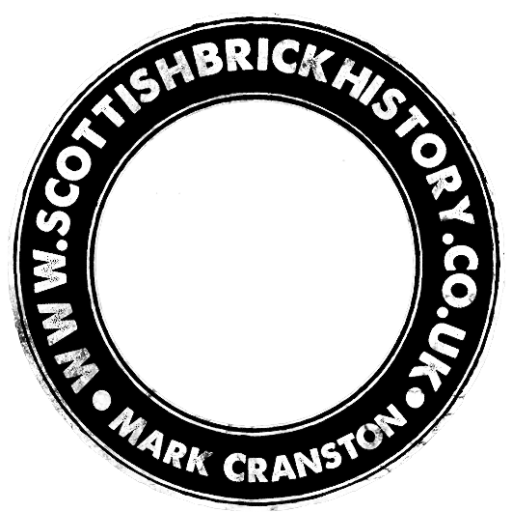 The brick measures 9″ x 4 1/2″ x 3″ and is cored – with 6 narrow holes. 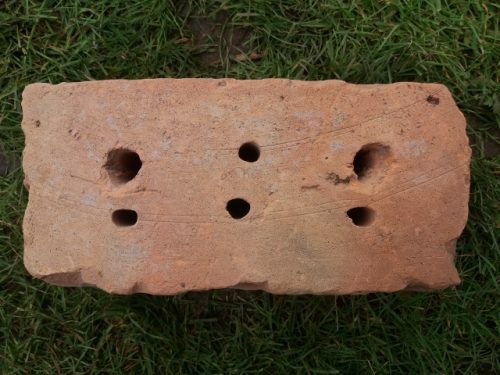 The holes top left and right have been enlarged as a lifting tool has been inserted into the holes. 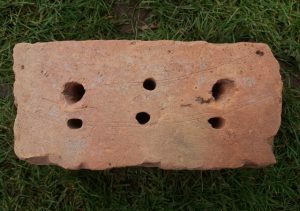 The distance between the centers of these holes is 5″. 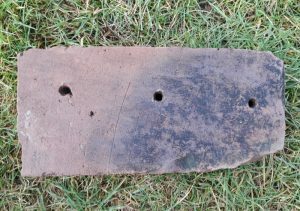 Around the middle hole on the bottom row is a slight circular indentation measuring 1 ” diameter. 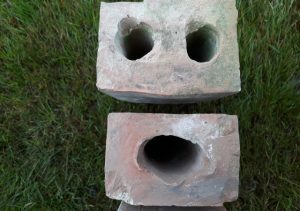 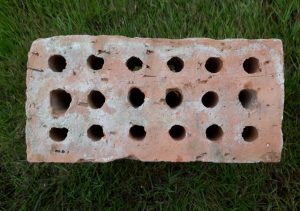 It appears a 2 pronged fork with a centered offset wooden peg was used to move these bricks around pre-firing. 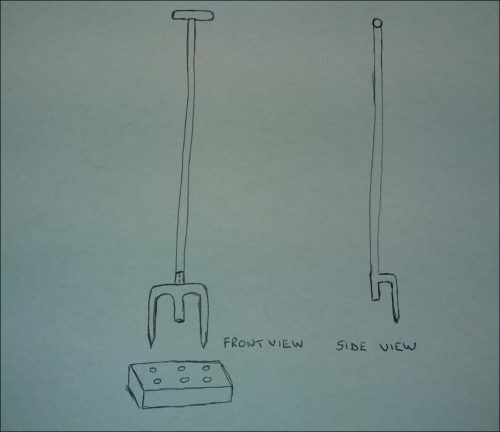 The wooden peg appears to acted as a ‘depth gauge’ or stop prevent you shoving the prongs in unnecessarily deep. 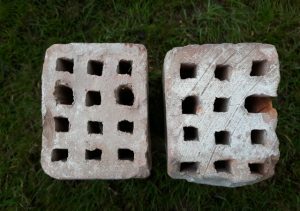 But as the wooden ‘stop’ is not aligned between the prongs it appears it also acts as a brace to stop the brick swivelling on the prongs above. 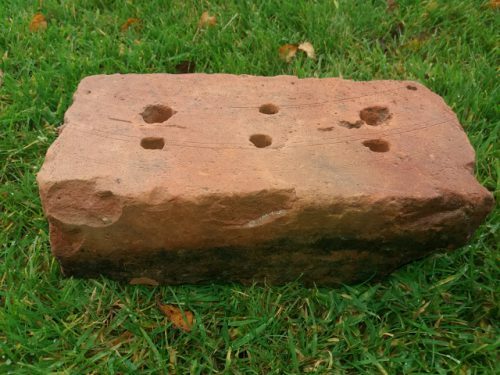 Below – The brick lifting tool may have looked something like this.